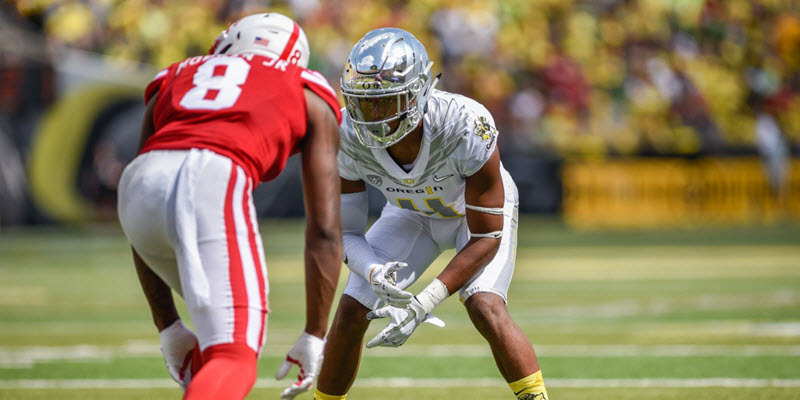 The Oregon Ducks have a problem at cornerback. They’re short! Oregon fields two 5’11” corners in their base defense, along with 5’10” Verone Mckinley III as the third guy. Last season’s recruit Isaiah Bolden (6’2″ 175 lbs.) looked like a start to fixing this problem, but he decommitted and went to Florida State. Why is height at the cornerback position so vital? Why could it be the downfall of this football team? Flash back to the Arizona State game last year. I know, memories of a certain head coach, a wasted season for our all time leading rusher, and a painful loss. But to understand why this loss happened, we need to examine the matchups on the edge. ASU’s N’Keal Harry (6’4″ 213 lbs.) 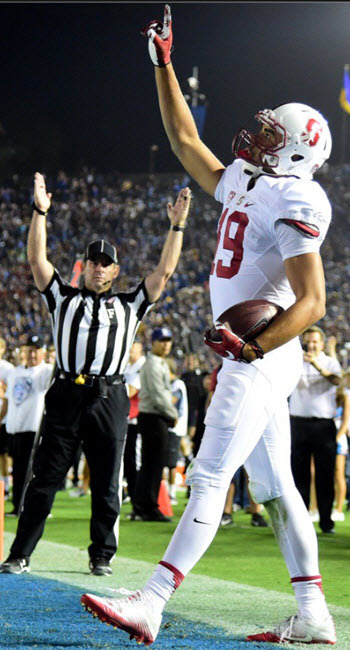 torched Oregon, with seven receptions for 170 yards and a touchdown. That’s almost 25 yards per reception. And his teammate Jalen Harvey (6’1″ 200 lbs.) had eight receptions for 133 yards, a healthy 16 YPR. Quarterback Manny Wilkins didn’t have to do much to beat a shorter, overmatched Oregon secondary. He just threw the ball in Harry’s general direction, and let the best receiver in the PAC-12 go to work. The play of the secondary so far this season doesn’t inspire a lot of confidence. In week one, Bowling Green State’s Jarret Doege threw the ball for 253 yards on 22 completions, while Scott Miller (5’11” 165 lbs.) had 13 receptions for 166 yards and 2 scores. In week two against Portland State, Oregon cornerbacks allowed several big plays where passes were completed over their heads. “But Miller is the same height as our corners,” I hear you typing. Well, Doege completed a number of passes to Miller due to the Ducks’ corners playing 8-10 yards off the ball most plays. Teams typically play loose coverage due to their inability to jam receivers at the line of scrimmage, so this indicates that the Ducks have little confidence in their corners in press coverage. Now I hear you typing “But what about our corners? Just how undersized are they?” Thomas Graham is 5’11” 191 lbs., Deommodore Lenoir is 5’11” 196 lbs. and McKinley is 5’10” 183 lbs. Are there receivers who are capable of imposing their physical will on these corners? Well, Harry is still playing for the Sun Devils, and the Ducks draw them at Autzen Stadium on November 17th. And there are plenty of others. What are the Ducks supposed to do schematically to make up for serious size disadvantages on the edge? When we look at Oregon’s difficulties in 2017, it is evident that they possessed a significant size disadvantage on the edge, and that it was exploited over and over throughout the season. This was particularly true in the Las Vegas Bowl, where Boise State receiver Cedrick Wilson went off on Oregon, with 10 receptions for 221 yards and a touchdown. Wilson is 6’3″ 187 lbs. 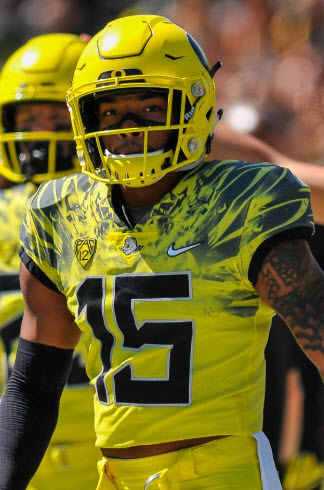 Now, there are some new Oregon cornerbacks who look a bit more physically imposing. Senior transfer Haki Woods is 6’3″ 201 lbs. and freshman Kahlef Hailassie is 6’2″ 188 lbs. However, they’re not going to solve the problem this season. Reports from training camp indicate that Woods is not on the same level as the other corners, and Hailassie is still a freshman, the fourth corner on the depth chart, and not yet ready to have more than a backup role. Sure, the Ducks are probably better than last season — how could they not be after playing so many freshmen and sophomores last year? But the size of the secondary is comparable to that of a group of five conference team, due to coaching staffs having failed in the last few seasons to add the same big bodies to the cornerback position that they have signed at so many other positions on the roster. The statistics show that the two losses where the Ducks were at full strength (Arizona State and Boise State) were due to significant size disadvantages in corner matchups with opposing receivers. Let’s hope that the very smart guy coaching the defense can come up with a way to compensate, or this could be a frustrating season to watch. Is Oregon going to lose a bunch of games this year? With Justin Herbert at quarterback and a stout front seven on defense it doesn’t seem likely. But is Oregon going to be elite this year?